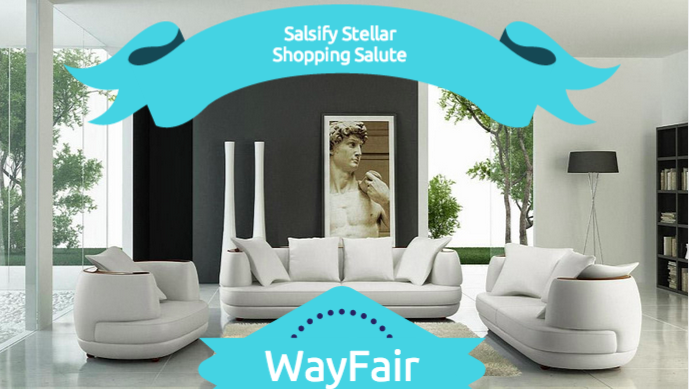 Salsify Stellar Shopping Salute: Wayfair, You Really Nailed It! May we send you relevant content such as ebooks, white papers, research reports, webinar invitations, and event invitations? I'm a bit of a shopaholic. My shopping habit is bad for my wallet, but it's a great asset when it comes to dissecting and sharing the effective strategies of successful ecommerce companies. 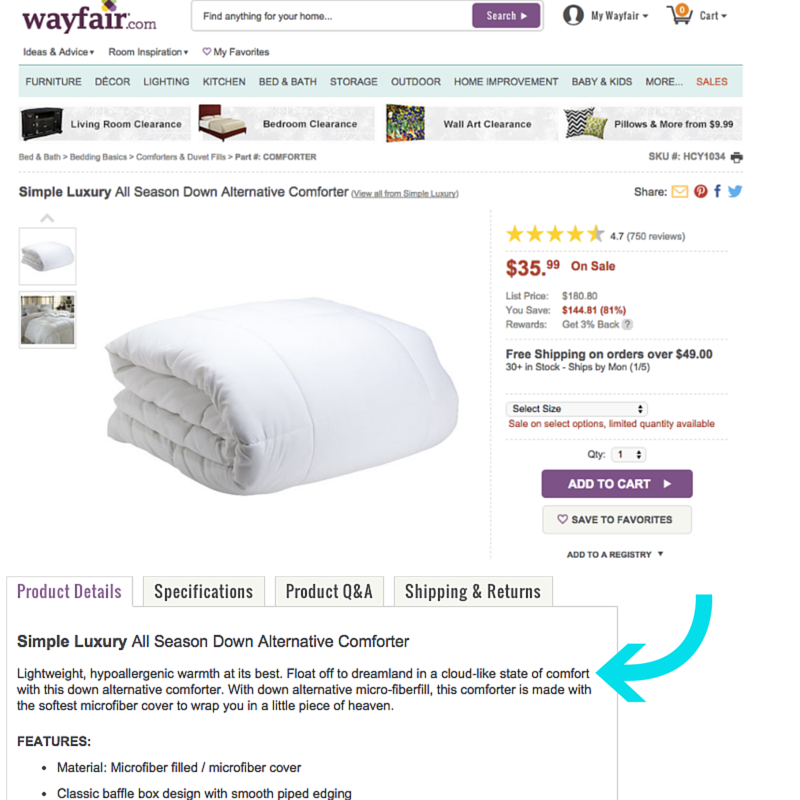 When I recently decided to purchase a new comforter, I searched far and wide before purchasing one from Wayfair. Here's the thing: Wayfair didn't just win my purchase, they provided such a fantastically positive shopping experience that they've also won over a loyal repeat customer which is why Wayfair is the recipient of our Stellar Shopping Salute. After a weekend away at a hotel in Midtown, New York City where I slept beneath a comforter as soft and puffy as a cloud, I was consumed with the need to replicate the tactile experience in my bedroom at home. With the holidays fast approaching, the comforter in question also need to be reasonably priced. I perused Amazon, Overstock, Kohls, Target, Walmart, but none of the products available within my price range seemed to represent the same fluffy, sleep-on-a-cloud feeling I was looking for. When I saw Wayfair's daily sale email announcing clearance bedding, it seemed like retail fate. In reality, it was just good email marketing. We've said it before and we'll say it again: effective product descriptions are crucial to the purchase decision, and here's why: As I browsed Wayfair's selection of down and down-alternative comforters options I was specifically searching for a comforter that offered the same fluffy "floating on a cloud" feeling I'd enjoyed during my recent hotel stay. Imagine my delight when I found a down-alternative comforter with the phrase "a cloud-like state of comfort" included in the product description! I was excited, but before I could even consider completing my purchase, I had to read the customer reviews. There's nothing more disappointing than purchasing a product that doesn't live up to its online representation, which is why I always read customer reviews before making a purchase. If reviews aren't available on the site in question, I try to find them elsewhere, and if all else fails I seek out the reviews of bloggers, although these are notably less reliable since bloggers are often provided with free products in exchange for a positive review. I rarely purchase anything online without some type of reassurance that the product is what it appears to be. Wayfair clearly understands the importance of product reviews - nearly every item onsite has extensive reviews, and its not by chance - Wayfair has an effective strategy to encourage shoppers to leave product reviews, but we'll get to that later. 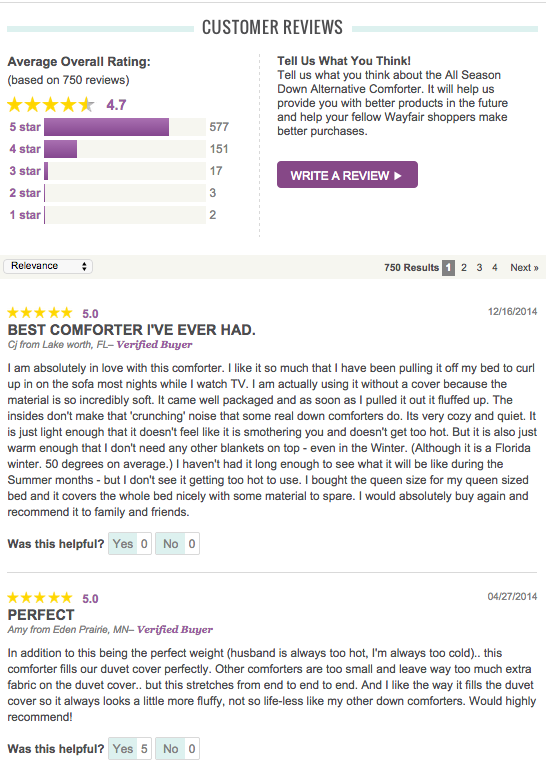 The comforter in question had nearly unanimously positive reviews, far more than any other comforter I'd seen. The comforter I'd chosen was so well priced I was about $10 under the minimum required for free shipping, so I decided to get myself a new travel mug to qualify. That's a great upsell: I was happy to get free shipping, and Wayfair just upped my average order value in one fell swoop. Even better, despite placing my order in the middle of the hectic holiday shopping season, Wayfair managed to undercut their estimated shipping time by an entire weekend: I ordered the comforter on a Wednesday and despite being told it would arrive on Monday, I received it two business days later, on Friday. Thanks to the customer reviews, I felt fairly confident that I would be happy with the comforter in question, but I was still blown away by the comforter when it arrived. It exceeded my expectations in every way: the product description was entirely correct, I did drift off to dreamland in a cloud-like state of comfort, I really did! 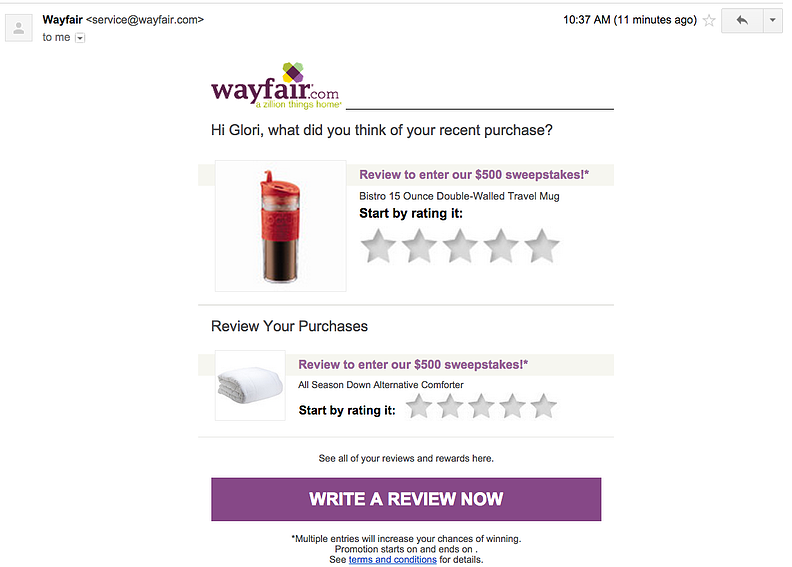 It wasn't until a few weeks after my purchase that I discovered Wayfair's ingenious strategy for incentivizing product reviews: I received an email from the home goods retailer encouraging me to leave a product review for my purchases in order to be entered to win a $500 gift card. This is a brilliant tactic: for a billion dollar company like Wayfair a $500 gift card is just a drop in the bucket, but it's highly desirable to the average consumer. Better yet, where it said "promotion starts and ends on" there was no date specified, so Wayfair could collect as many reviews as they like, for months or even years if desired, before choosing a winner. Timely email marketing reminded me to check their current selection, which is exactly what email marketing is supposed to do. A great product description that used the specific terminology I had in mind. Extensive product reviews were provided, which provided reassurance that Wayfair's product actually lived up to its description. I was quickly re-engaged by the Wayfair Marketing team via email and given an incentive to revisit their site and give a product review, so that I had another opportunity to shop the site and provided an additional review to help convince the next shopper who comes along to click "buy"
For all of these reasons, and for providing me with the softest, coziest comforter I could ask for at a unbelievably reasonable price, Wayfair is the recipient of this week's Stellar Shopping Salute, and my loyal patronage.